The growth of mildew requires warmth, moisture and food. Washing machines meet all these requirements, making them perfect breeding grounds for this early-stage mold. 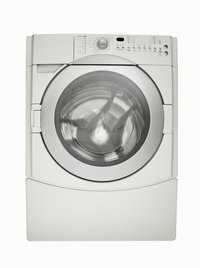 Washing machines in busy households are even more prone to developing mildew; their constant use prevents them from ever drying out, which would eliminate one of mildew’s requirements. Mildew is not only unsightly and unhealthy; it also creates an unpleasant musty smell. You can eliminate both the mildew and the odor with household bleach. Remove both the bleach and soap dispensers from the washing machine. Wash them in warm water and dish soap. Rinse the dispensers thoroughly and put them back in the machine. Scrub the bleach and soap dispensers with a toothbrush if the dispensers are not removable. Put a couple of drops of dish soap on the toothbrush, scrub the dispensers, then pour clean water over them to rinse. Clean the seal around the opening of front-loading washers. Use a toothbrush moistened with water and a couple of drops of dish soap to scrub the seal gently. Finish by wiping off the seal with a rag moistened with water. Remove the lint trap and clean it of any lint or debris. Replace the lint trap. Pour 1 cup of bleach into the bleach dispenser and start a wash cycle using hot water. Put a white towel in the washer to provide mass that will move around during the cycle, cleaning the sides of the washer bin. Remove the towel when the cycle is complete. Leave the washer door open to allow the washer to dry. Make it a habit to leave the washer door open between loads to prevent the warm, moist conditions that encourage mildew growth. You can help prevent the return of mildew growth by running a hot-water cycle with bleach once a week. Use caution when leaving a front-loader door open if you have young children in the house.